The HH85 is a handheld thermometer packed with features. 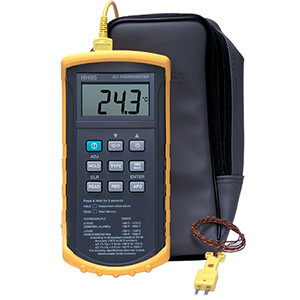 It can read either a K or J type thermocouple in degrees C or F. The meter offers a 125 point memory storage feature. An APO key allows the unit to be automatically turned off after 15 seconds. A backlit key feature allows use of the meter in a dark environment. The HH86 is the two input version which also offers reading of T1, T2, or T1-T2. 참고: Each unit comes with protective holster, 9 V alkaline battery, type K thermocouple (1 per channel) and instruction manual.